The Great Barrier Reef – dead? In my senior year of high school, I decided to take Marine Biology; since I grew up on the Jersey Shore and loved the ocean I figured it would be a very interesting course. Sure enough, every day was filled with a captivating lesson and each field trip consisted of going to the beach and analyzing the marine life. During one lesson, my teacher began to tell my class how she had scuba dived in The Great Barrier Reef in Australia. She presumed to show the class a number of mesmerizing photos that immediately captivated me. The different colors of the coral and the different exotic fish confirmed that one day I too would visit The Great Barrier Reef. It wasn’t until a few weeks ago when my dream of visiting The Great Barrier Reef was presumably crushed. Social media sparked when the pictures below were shared on sites such as Facebook, Instagram, and Twitter. A number of social media users believed these photos were declaring The Great Barrier Reef dead. But is that true? Is The Great Barrier Reef actually dead? The assumption of The Great Barrier Reef being dead draws two hypotheses; the Alternative Hypothesis, The Great Barrier Reef is not dead, and the Null Hypothesis, The Great Barrier Reef is dead. So what is happening down in Australia? According to Russell Brainard, who is the Chief of Coral Reef Ecosystem, says the Great Barrier Reef is not necessarily dead, but it is indeed dying. Brainard explains that article headings are giving people a scare believing that the Great Barrier Reef is dead, but in actuality it is dying. He says the titles are exaggerating the truth about the Great Barrier Reef being dead, and for people who don’t actually read the full article will actually believe it is dead. 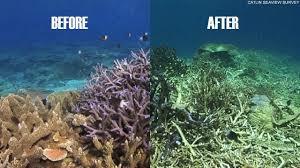 People believed that The Great Barrier Reef was dead because of pictures, shown below, of a recent bleaching the coral faced. According to The National Ocean Service, when coral is stressed by changes it overcomes algae will leave the coral leaving the coral very vulnerable. So, there we have it the Alternative Hypothesis stands, The Great Barrier Reef is not dead. So, although The Great Barrier Reef is not indeed dead, Russell Brainard did explain that The Great Barrier Reef is still in risk of dying. Why is it dying and how can we prevent one of the Seven Wonders of the world from vanishing? 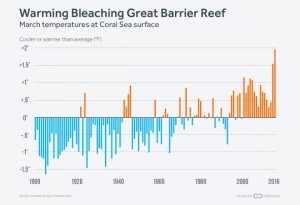 According to Scientific American, the corals have faced a severe bleaching. Bleaching is caused by hot waters which is primarily because of Global Warming. 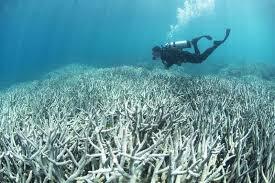 The hot waters cause the coral to spew out algae; the less algae, the less protection the coral has. 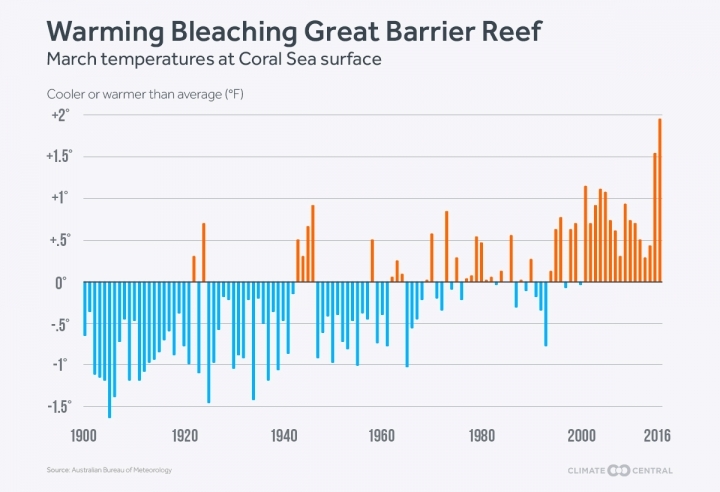 As the global temperature rises there is a direct correlation to the rise of coral bleaching. So since warm waters and warmer temperatures are causing the Great Barrier Reef and coral reefs all over the world to slowly die, what can we do to prevent it? According to The Nature Conservancy, there are so many little things that everyone can do to help protect the Great Barrier Reef and other coral reefs. One helpful step would be to conserve water; don’t use water that you don’t need, the less you use results the less runoff water that will go into the ocean. Another helpful solution, is to discover what pesticides you are using on your lawn; pesticides can run off in the ocean and possibly hurt marine life. These are only a few measures you can take to help The Great Barrier Reef from official dying, but check out more here! Although The Great Barrier Reef is not officially dead like social media and false News Article Headings said, it is definitely at risk of dying. There is so much to do from conserving water to properly disposing your trash in order to protect it! Don’t let one of the Seven Wonders of the world disappear because we are careless with the way we treat our planet. Even though The Great Barrier isn’t dead it is definitely a scary to wonder a world without the beauty of this coral off of the coast of Australia. This entry was posted in Uncategorized on November 12, 2016 by Gulianna E Garry. Your blog was very interesting to me because I also have always wanted to go to Australia to see the Great Barrier Reef. I had no idea that it was dying or assumed to be “dead” so I was surprised while reading this and looked into it as well. After learning about the bleaching process in your post it also had me wondering if the fish and other species in the water could have any effect of the reef? http://www.barrierreefaustralia.com/the-great-barrier-reef/reef-dangers.htm In this website it does not say anything dangerous about the species to the Great Barrier Reef, but that many of them can be fatally dangerous to humans.